Two of the greatest challenges a laboratory network faces when tackling high-risk global health security threats is the safe transportation of a potentially bio-hazardous specimen and the length of the waiting process for test results. To combat this, we must look to innovative approaches for the efficient transportation of samples and test results through integrated and highly centralised laboratory networks. Ultimately, the goal is a substantial reduction in time during that crucial window where urgent care is critical to the individual patient and the containment of the health security threat. Laboratory networks, such as the African Public Health Laboratories Network (APHLN), have been looking at specific approaches to accelerate sample and test result delivery that can be applied on regional or international levels. Uganda has shown particular success in this area, beginning with steps taken by the Ugandan Ministry of Health in 2006 to implement Early HIV Infant Diagnosis (EID) testing. 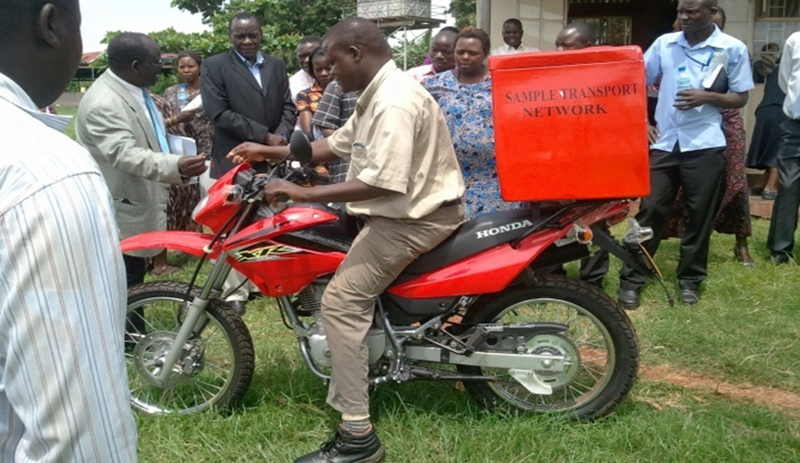 Previously, laboratories in Uganda had relied on the country’s major courier provider (Posta Uganda), to deliver samples and results between health facilities and laboratories. But this system was flawed, serving only the 35% of facilities that were located in urban areas along the postal delivery routes . In some cases, trained health professionals themselves were tasked with bringing samples to be tested, not only inconveniencing them, but depriving patients of care while they were gone from their posts. The system, in addition to being prohibitively expensive, resulted in long result turn-around time and was therefore detrimental to patients’ access to care, as their conditions were liable to worsen in that lengthy span of time. Fortunately, a solution was devised in the form of a National Sample and Results Transport Network (NSRTN) based on creation of laboratory and sample transport hubs that are linked to the in-house courier delivery routes. 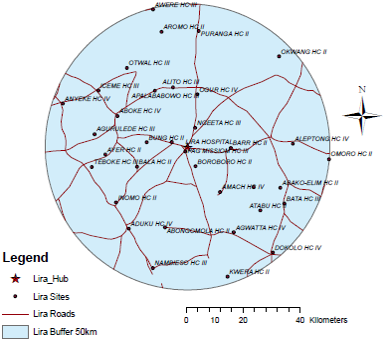 Essentially, the network functions by establishing laboratory hubs in the sub-district region, each of which serves about 30 health facilities within an catchment area of an estimated 40 kilometre radius. 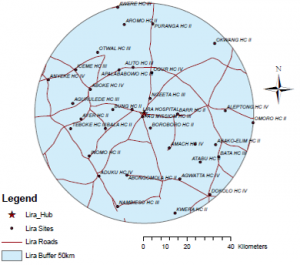 Each hub is provided with a bike and a rider, who through a pre-set schedule reaches all facilities within the catchment area, retrieving samples and delivering results from the previous visit. The network is currently comprised of 77 hubs, which allow access to over 2,300 health facilities, and that number will increase in 2016 with the additional roll-out of 23 additional hubs – totalling 100 hubs and reaching over 3,000 health facilities [1, 2, 3]. The network’s success relies heavily on connecting lower-level community laboratories, which lack the capacity to run high-level diagnostic testing services, with the better-equipped hubs. By combining the extensive reach of the hubs to the lower-level laboratories, patients across the country have greater access to EID, CD4, HIV viral load, and a number of other specialised tests, resulting in a standardised and elevated level of care. In a comprehensive study on the effects of NSRTN on EID testing in Uganda, researchers determined that the network reduced both the time and cost of sample and result transportation and increased the total volume of tests that could be performed . Interview with Charles Kiyaga, Uganda Ministry of Health and ASLM Country Ambassador, 15 December 2015.